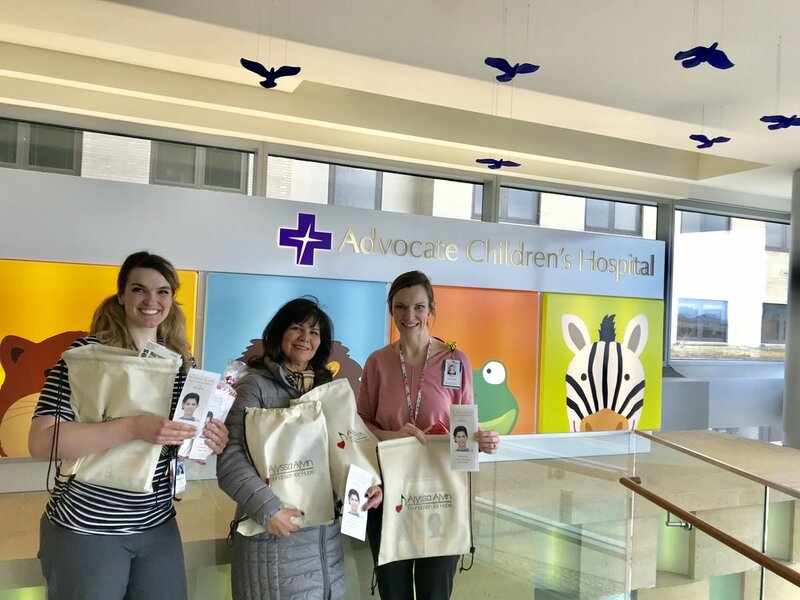 50 Alyssa Starter Art Kits (SAKs) were delivered to the Advocate Children’s Hospital in Park Ridge, IL on Sunday, March 10, 2019. Beth and Kate, both Art Therapists, took receipt of five different kinds of Alyssa SAKs-acrylics, watercolors, adult coloring books, drawing and journal kits. These art materials will enable the young patients to express their creativity in a joyful manner while undergoing treatment for their illnesses. We are thankful for the opportunity to share Alyssa’s love for the arts with young patients being treated in the Park Ridge Campus of the Advocate Children’s Hospital. Eaden is a 10-year old boy who lives with his family in Chicago, IL. Eaden was diagnosed in October 2018 with craniopharyngioma and is being treated at Northwestern Chicago Proton Center in Warrenville, IL. 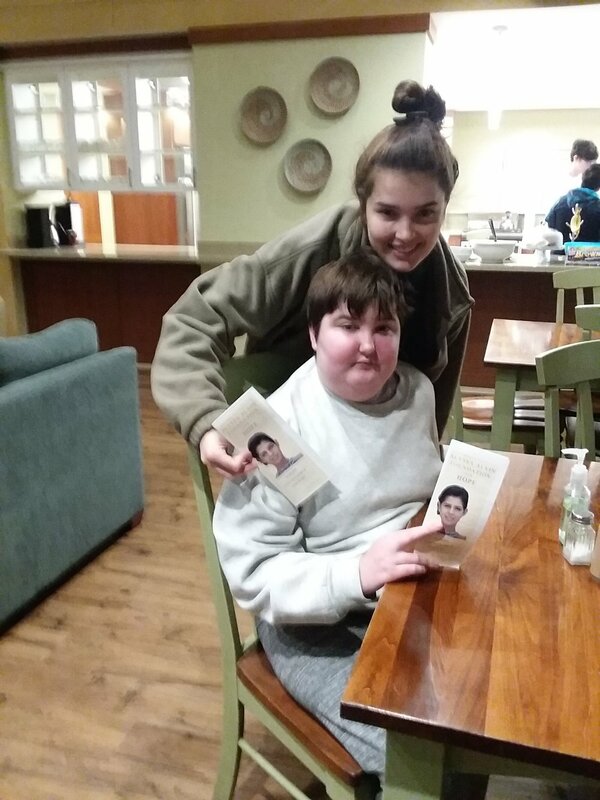 We met Eaden when he participated in Art Night at Ronald McDonald House near Central DuPage Hospital on Monday, February 11, 2019. Some of the things Eaden likes to do include painting and working with clay. Eaden wants to learn art techniques and Fadia-Eaden’s Mom mentioned to us that she will be helping Eaden explore other art mediums and also participating in art projects with him. On Wednesday, February 20th, Yoli visited Eaden at RMH to deliver his professional art supplies. Eaden was on the second floor while Yoli arranged all his art materials on a table in the main gathering room. Eaden told his mom he wanted to go downstairs because there was going to be an Art activity. He did not know at the time that all the art materials were for him. Eaden was surprised when he came down to find out it was all for him! When Yoli presented Eaden his art supplies package, he thanked Yoli and he too gave her a special gift of a Money Tree plant and a hug. This made for a very special moment. Eaden exclaimed, “this makes me happy!” He will now be able to create art while at Lurie Children’s hospital or Chicago Proton center. In addition to delivering Eaden’s gift, Yoli donated 50 of Alyssa Starter Art Kits (SAKs) to Lauren White-RMH Manager. Eaden was able to get some of the Alyssa SAKs. He couldn’t help but continue to SMILE while we were there. We are encouraged by Eaden’s strong will and we pray for his health. We look forward to seeing his artwork in the near future. Alyssa Starter Art Kits (SAKs) were delivered to the Johns Hopkins All Children’s Hospital in St. Petersburg, FL on Monday, February 18, 2019. Executive Officers of Alyssa Alvin Foundation for Hope: Yoli Alvin-President, George Alvin-VP/Treasurer and accompanied by Beverly Hann-volunteer met with a Child Life Staff member-Tricia Tyoe. The SAKs included five different variations consisting of acrylic, watercolor, drawing, ocean coloring book and journal kits. We hope these kits will help bring a bit of joy and hope to those children going through a difficult time during their treatments for life threatening diseases. At Johns Hopkins All Children’s Hospital, Tricia is the newest staff member of the Child Life Department. Tricia is looking forward to sharing our Alyssa brochures with the Oncology nurses and staff to ensure more children are able to take advantage of the Alyssa Foundation music and art gift recipient programs. Tricia was grateful for the SAKs and stated they would be welcomed by the children receiving treatment at the hospital. We look forward to continuing our relationship with Child Life at Johns Hopkins All Children’s Hospital. 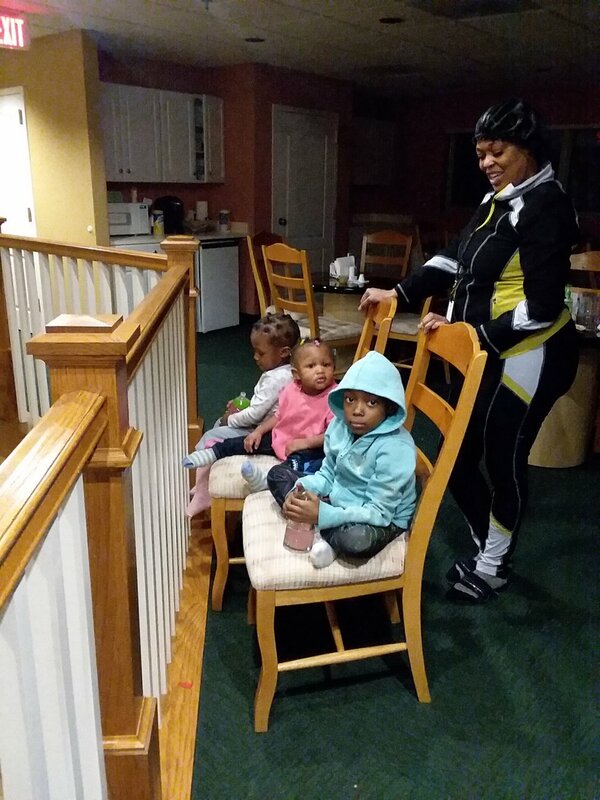 The Alyssa Alvin Foundation for Hope (AAFH) held an Art Night at the RMH near Central DuPage Hospital in Warrenville, IL on Monday, February 11, 2019. We provided red, pink and white acrylic paints, paint brushes and papier-mache heart shaped boxes of different sizes for the children and their family members to create a special Valentine themed art gift. The paint brushes were provided by Judy Goral-Artist from Lemont, IL. We met Lauren White - House Manager, young patients and family members who were ready to participate in the Valentine themed art project to create fun gifts for their loved ones. Whatever the age or talent level, all had lots of fun interacting with each other and expressing their individual styles of creativity. At each Art Night, we are fulfilling the mission of Alyssa’s Foundation and we are so happy to do just that in keeping with Alyssa’s passion for art. Art Nights also provide for the needs of the young patients in sharing their joy and love for life. After this Art Night event, one young patient – Eaden submitted his Gift Request to the Alyssa Foundation and we are looking forward to honoring his request for art supplies prior to his departure from the RMH. Daniel Guerrero was welcomed as our newest member of the AAFH Board at the first meeting held on Sunday, January 20, 2018 at the Casa Margarita in Downers Grove, IL, Daniel is a cousin of Alyssa and has been an active volunteer since the AAFH was established. He has taken the lead in coordinating one of our more successful annual events over the last two years, the Spring fundraiser at Old Crow Smokehouse. He is currently putting together this year’s event and we anticipate another successful event in 2019! As a new Board member, Daniel looks forward to being supportive to a greater degree in this year’s AAFH events in memory of Alyssa and in fulfillment of the AAFH’s mission in bringing joy through our music and art programs to young patients who are experiencing their own cancer and/or life-threatening illness. 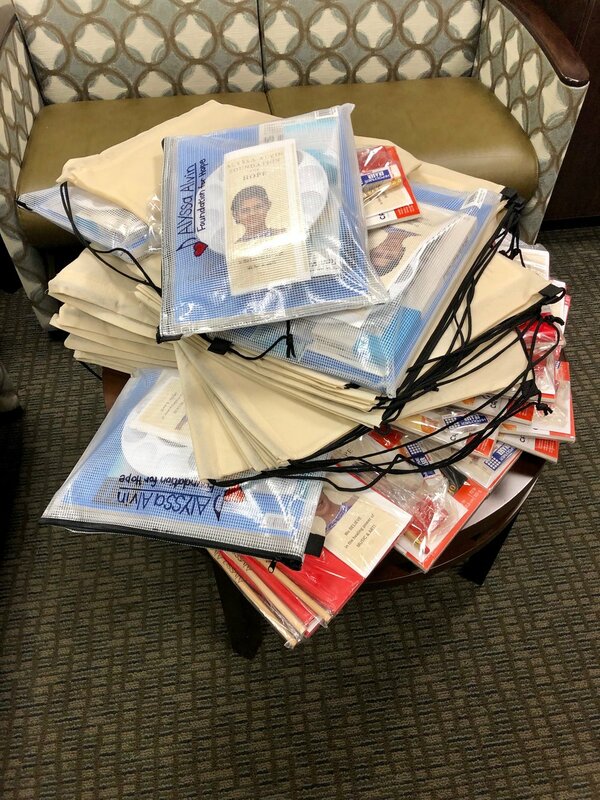 A total of 1050 Alyssa Starter Art Kits were delivered to 24 hospitals, medical institutions and RMHs in the Chicagoland area, Florida, Pennsylvania, Indiana and Mexico. There were 54 gift recipients who received their personal gifts of musical instruments, headphones, crafting items and art supplies. Our volunteers provided support in successfully carrying out 9 Art Nights and 5 Music Nights at 7 RMHs in the Chicagoland area and in St. Petersburg, Florida. We want to thank our 215 volunteers for continuing to assist us in fulfilling our mission and our generous donors for their financial contributions! On Saturday, December 29, 2018, Yoli Alvin -President of AAFH was presented with a donation check by Dan Lehv-President of Chicago Steel and Hannah Schmidt-Artist from The School of Art in Geneva, IL. Our heartfelt thanks to the generosity of the Chicago Steel fans at the Crazy Hat Night game of Friday, November 30th. The auctioned helmets from the game raised a net amount of $1,833.23 in support of the Alyssa Alvin Foundation for Hope. We are very grateful to the Chicago Steel leadership team Dan Lehv-President and Kyle Kreger-VP and the School of Art Team-Jen, Vinnie and Hannah for selecting us as the not-for-profit organization to partner and work with us in this fundraising event. Your support directly provides hope and joy through our music and art programs for children and young adults whose lives are affected by a life-threatening disease. The BCBS of IL employees organized a volunteer team on Wednesday, December 19, 2018 to create Alyssa’s Starter Art Kits (SAKs) in support of the Alyssa Alvin Foundation for Hope (AAFH) in time for this Christmas season. A total of 36 volunteers set a record of 45 minutes time to complete 200 Alyssa SAKs! AAFH earns Matching Dollars for each volunteer hour logged into Blue Corps and has been a community partner since 2016! This volunteer effort was led by Denise Perez-Cabrera, Executive Secretary of Alyssa Alvin Foundation for Hope. We appreciate Denise for her dedication to Alyssa’s foundation. These Alyssa SAKs will be delivered to teens and young adults being treated for cancer and other life threatening diseases at hospitals and Ronald McDonald Houses across Illinois, Florida and Mexico. A big “THANK YOU!” to our volunteers from BCBSIL and all the volunteers who helped us during 2018. A total of 1,030 Alyssa Starter Art Kits have been delivered during 2018 and it is only because of YOU, our volunteers! You have our sincere gratitude. The Alyssa Alvin Foundation for Hope (AAFH) held an afternoon art event at the Ronald McDonald House East near Johns Hopkins All Children’s Hospital in St. Petersburg FL on Friday, December 14, 2018. AAFH provided oil-based paints, paint brushes and mixed media paper for the children and their family members to create Christmas themed art. The art supplies were provided by Judy Goral-Artist from Lemont, IL. We met Karen Matthews, House Manager, and several teens, young children and family members who were eager to participate in the art activity to create fun Christmas art. We also delivered a supply of Alyssa Starter Art Kits (SAKs) to the RMH East for the benefit of the children and families currently staying and for those to come. Regardless of age or talent level, all had a lot of fun interacting with each other and otherwise expressing their individual styles of creativity. This is exactly what we are so happy to do at each of our art events in keeping with Alyssa’s passion for art as well as the needs of the young patients to share their joy and love for life. After the art event, each participant received a gift of one of the SAKs.We are glad to have had this opportunity to hold this art event and provide these gifts to the children especially during this time of the year.Our intent is to bring them a bit of hope and joy through this Christmas season. Alyssa Starter Art Kits (SAKs) were delivered to Rush Copley Cancer Center in Aurora, IL on Tuesday, December 4, 2018 by Nadia Tourjman-AAFH volunteer. Nadia coordinated the assembly of the Alyssa Starter Art Kits (SAKs) at an Exelon Volunteer Event held in early November. Laura Rollins -Oncology Social Worker- at the cancer care center received 50 0f the Alyssa SAKs. The delivery included 5 different types of Alyssa SAKs – Acrylic paints, watercolors, adult coloring books, drawing and journal kits. These art kits will be given to young adults being treated for life threatening diseases at Rush Copley. Laura mentioned that the cancer care center had only two Alyssa SAKs from a previous donation and she was glad to get more. Laura was excited to be able to give the young patients an Alyssa SAK and is looking forward to them being able to have fun expressing themselves through art. The Chicago Steel and School of Art Geneva presented Crazy Hat Night at the Fox Valley Ice Arena to benefit the Alyssa Alvin Foundation for Hope on November 30, 2018. The Chicago Steel (United States Hockey League) made hockey history by wearing specially designed helmets during the game against the Central Illinois Flying Aces. The helmets were auctioned off after the game to provide art supplies and music instruments for young patients battling cancer. Each Steel player wore a unique helmet designed by area students and artists as part of the team’s Crazy Hat Night. The event made for a more colorful viewing experience for fans with the home team donning the special lids. 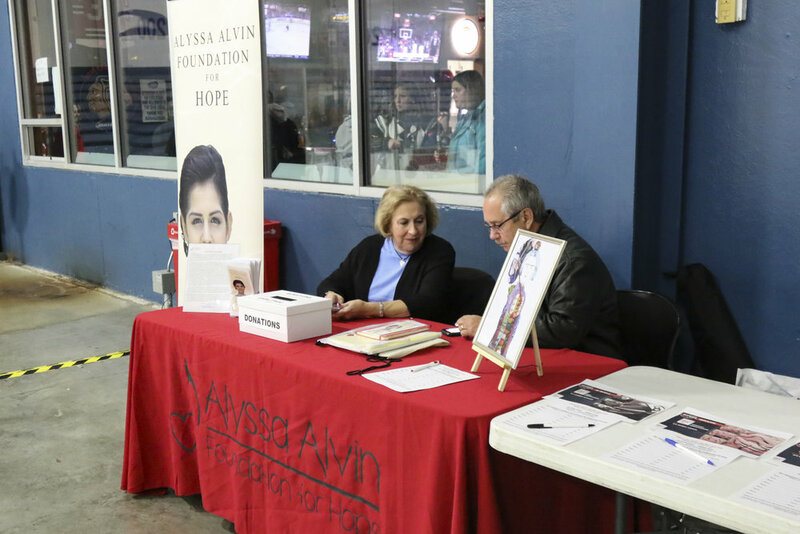 Many thanks go out to the Chicago Steel organization, the School of Art Geneva and to all who attended the game for making this a memorable event and for the support given to Alyssa Alvin Foundation for Hope. Student musicians and Madrigal singers from Yorkville High School joined the Alyssa Alvin Foundation for Hope (AAFH) at the Ronald McDonald House near Loyola Medical Center to entertain patients and their families with the healing power of music on Monday, November 12, 2018. 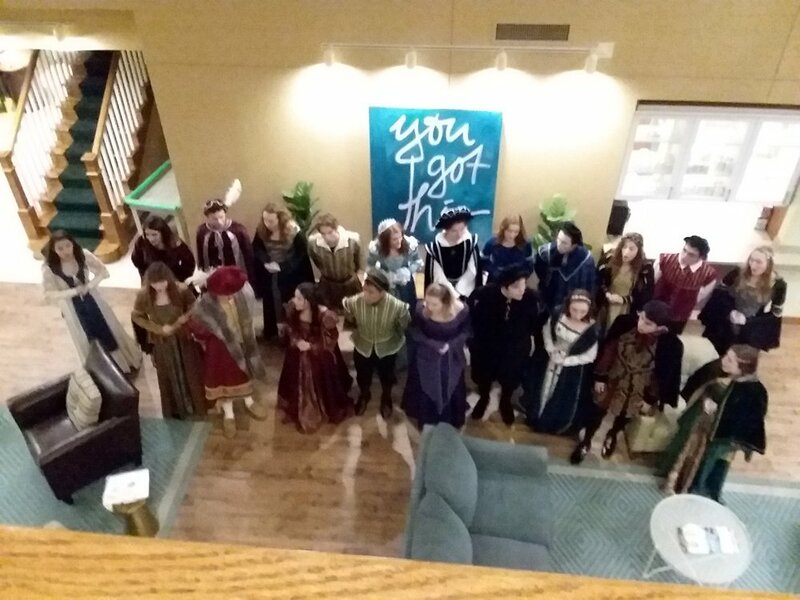 The Yorkville Madrigals were led by David Smith, their Music Director, and this event was planned by Huntar Jones, a former member of the Yorkville High School music group and a regular AAFH volunteer herself. The 35 musicians not only drove over 90 minutes to get thru rush hour traffic to the performance, but they also donated their own time to practice in preparation for this music night. They were met by AAFH President- Yoli Alvin and volunteer-Huntar Jones, as well as several families including children ranging from toddlers to teens. During the 1-hour performance, all ages sat in rapt attention at the beautiful music created by the strings of the musicians and the voices of the singers dressed in Renaissance period attire. As we mingled with the young audience members before and after the show, we were impressed with the attention and appreciation they gave to the musicians. In talking with them about their physical conditions, we were moved by the fact that we took them away from their own health challenges at least for the duration of the performance. We could see in their faces and hear in their applause that the patients and their family members were free from pain, discomfort and stress while being moved by this beautiful music. Thank you so much to the student-musicians and Madrigal singers, their leaders, David and Huntar, our volunteers and all of you for making evenings like this possible in Alyssa’s memory! Asher Rubio is 16 years old and lives in Romeoville, IL with his family. Asher enjoys expressing his creativity with paper crafting. He started with origami and it took off from there! He also loves scrapbooking and hand projects. Asher was diagnosed with B-cell acute lymphocytic leukemia in February 2017 but recently relapsed. He is being treated at Lurie Children’s Hospital and staying at the Ronald McDonald House near Lurie’s (RMH). On Thursday, November 8, 2018 I had the pleasure of meeting Asher and his mom, Martha, at the RMH. Asher is a very bright teenager and exudes confidence that he will overcome this recent setback to his health with his family’s support and the treatment he is receiving at Lurie’s. 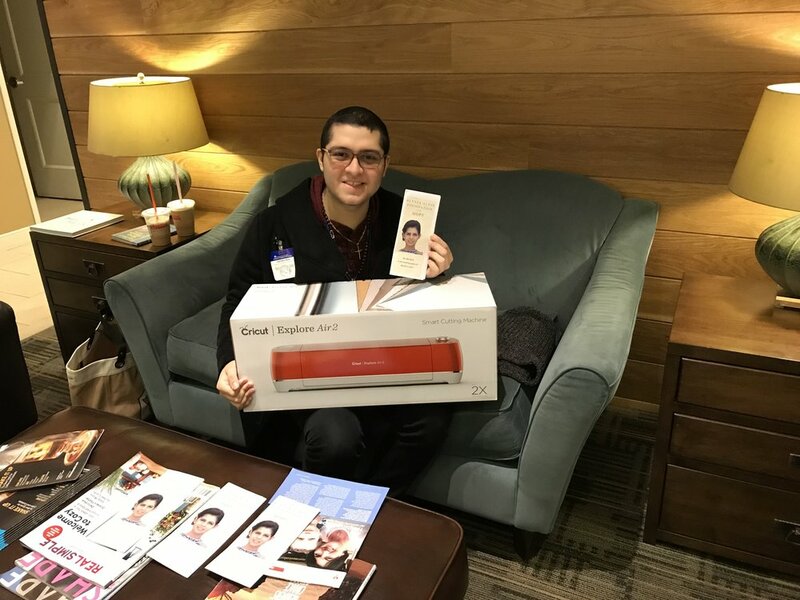 It was a joy and honor to present Asher with a Cricut Explore Air 2 in a persimmon color. The Cricut is a personal DIY cutting machine for various craft making materials. Seeing Asher’s expression and joy in receiving this small gift made my trip to RMH all the more worthwhile and heartening. The work of AAFH, made possible by our financial supporters and volunteers, means so much to the young cancer patients. Our gifts and arts programs are intended to lift their spirits and bring them joy at a time in their lives when they’re facing life-threatening illnesses. We are grateful for the opportunity to share Alyssa’s love of art and promote the programs offered by Alyssa Alvin Foundation for Hope! We wish Asher all the best as he continues with his treatments and we pray for his full recovery.